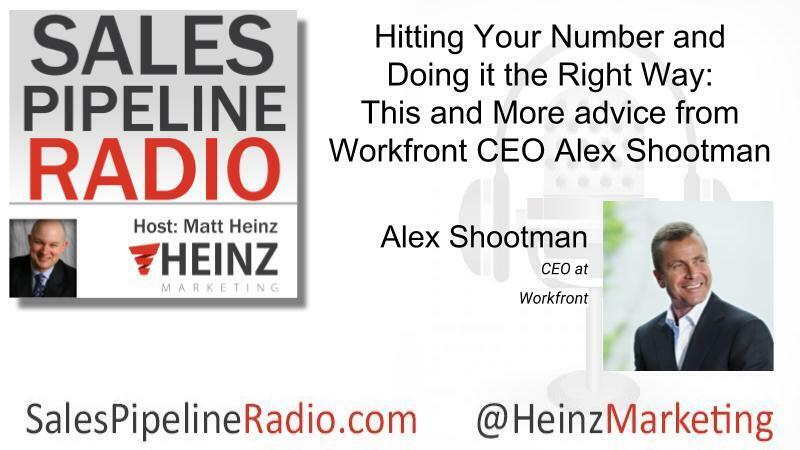 Alex Shootman, CEO of Workfront joins us this time as we talk about principals of doing things "The Right Way". Check out his book, Done Right: How Tomorrow's Top Leaders Get Stuff Done. It pulls from over thirty original interviews with experienced leaders across a variety of industries to show how tomorrow's leaders can effectively navigate the modern workforce. "... this notion of getting it done and doing it right-- and mentally, if you think about a two by two grid, with a vertical axis being getting it done in a horizontal axis, being doing it right, it's a notion of ... the vertical axis is low to high. Are you getting it done or are you not getting it done? Doing it right is are you living up to the values of an organization or are you not living up to the values of an organization? It's this notion of if you're not getting it done but not doing it right, it's probably not great place for you. If you're doing it right, but you're not getting it done, you have the values of the organization, but you might need some coaching on how to objectively accomplish the role that you've been given." "If you're getting it done and you're doing it right, you're the person that everybody ought to see their name in lights. The tough one is if you're getting it done, but you're not doing it right, you probably ought to be fired faster than anybody in the organization, because nothing destroys the pursuit of the culture that you want in a company faster than being willing to tolerate people who can accomplish their goals but don't live up to the values of the organization." "What I found over time is I believe people are good and people want to do the right thing. A lot of times they just haven't been given the space to put a premium on values."